A fast start is expected for the Rolex Sydney Hobart Yacht Race this afternoon. However, soon after day turns to night the fight for line and handicap honours is expected become one of strategy and tactics as winds weaken, according to Matt Allen, the owner and skipper of defending Tattersall Cup winner, the 52-footer Ichi Ban. The official range, produced by our partners, Musto, is on sale now - but stock is strictly limited! Boxing Day in Australia is the perfect excuse to fire up the barbeque, devour leftover Christmas feasts and kick back to watch one of the world’s toughest yacht races. She is the smallest boat with the smallest budget and crew in the Rolex Sydney Hobart Yacht Race fleet this year, but according to her skipper, Reece Young, Gun Runner has a lot to offer in the Cruising Yacht Club of Australia’s 628 nautical mile race. When Beth Cain wrote down an ambitious “bucket list of things to do before turning 30,” little did her parents and sister envisage that by listing the Rolex Sydney Hobart Yacht Race it would become a family affair. Eric de Turckheim, with his La Rochelle and Lorient crew – plus one Italian, came to Australia to achieve a childhood dream – to win the Cruising Yacht Club of Australia’s Rolex Sydney Hobart Yacht Race. Christian Beck will not get ahead of himself with celebrations at the finish of this year’s Rolex Sydney Hobart Yacht Race, no matter where his line honours contender InfoTrack places. Kayimai is a new boat and, after a respectable finish in the PONANT Sydney Noumea Yacht Race, has a bright future her owner tells OLIVIA PRICE. Barry Cuneo, the Queensland owner/skipper of the TP52, Envy Scooters, proclaims: “I want to win the 2018 Rolex Sydney Hobart Yacht Race for my uncle John,” he says of Australia’s famous 1972 Olympic Games gold medallist in the Dragon class. Mark Griffith is not shy when it comes to staking his claim as a contender for overall victory in the Rolex Sydney Hobart Yacht Race. The number of international entrants in this year’s Rolex Sydney Hobart Yacht Race is now 11, but delve in to their respective crew lists and a veritable league of nations emerges. Tasmanian boats in the Rolex Sydney Hobart Yacht Race have a bit of an advantage over their NSW rivals – their boats have to be prepared before they leave for Sydney – and then their crews get to test the boats and crew out on the delivery to Sydney – a reverse Sydney Hobart. Matthew Donald laughs when the scenario of his Rolex Sydney Hobart Yacht Race entrant, Gweilo, appearing from her shroud of relative anonymity as a newcomer to the Australian racing scene to win the event overall is put to him. Tim Stewart has brought his Salona 44, Anger Management, all the way from Esperance in Western Australia to challenge the Tattersall Cup in the Cruising Yacht Club of Australia’s annual Rolex Sydney Hobart. 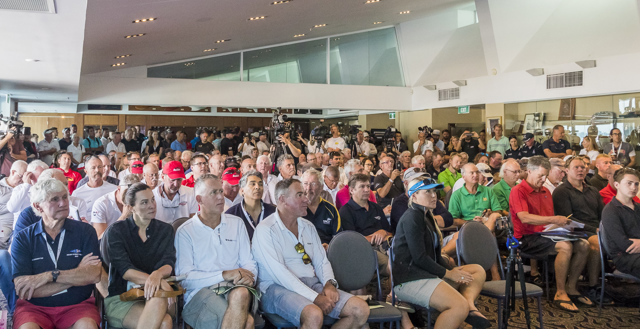 Five very different overall contenders for the Rolex Sydney Hobart’s prized Tattersall Cup rated their chances for winning the 628 nautical mile race at a press conference at the Cruising Yacht Club of Australia today. You may not see them – and in some cases you may not know them - but when the cannons are fired signalling 10 minutes to the start of the Rolex Sydney Hobart, five minutes to the start and then the start in Cruising Yacht Club of Australia’s (CYCA) famous race, the people chosen for these duties are chosen for a reason. Ce matin à la conférence de presse du Cruising Yacht Club of Australia, Simon Louis, du Bureau de Météorologie, a donné quelques avant-premières prévisions du temps pour la course Rolex Sydney Hobart. Les navigateurs présents ont ainsi appris que l’on pouvait s’attendre à un peu de tout aux premiers stades de la course nautique de 628 miles. In an early forecast prediction, the Bureau of Meteorology’s Simon Louis told a selection of navigators at a Rolex Sydney Hobart Yacht Race press conference at the Cruising Yacht Club of Australia today to expect a little of everything in the early stages of the 628 nautical mile race. With less than a week until the Boxing Day start of the Rolex Sydney Hobart Yacht Race, registrations are open for what will be the blue water classic’s second year of partnership with Virtual Regatta, the world's leader in cutting edge sailing simulation games. Your modern ocean racer is a pretty wild beast. It accommodates humans grudgingly, but mostly they are big hollow carbon shells with a huge sail locker in the front and a basic head (toilet) with a curtain around it (if the skipper isn’t too weight conscious). German yachtsman Freddy Boehnert has sailed over 18,000 nautical miles on his X-50 Lunatix, just to contest the Cruising Yacht Club of Australia’s (CYCA) 2018 Rolex Sydney Hobart Yacht Race – unusual – as European owners normally ship their boats to Australia for the race. Intense preparation is the name of the game as realisation dawns on owners and crews that only nine days remain before the start of the Cruising Yacht Club of Australia’s (CYCA) 2018 Rolex Sydney Hobart Yacht Race. All you need to know about the Grinders Coffee SOLAS Big Boat Challenge, including how to watch it live or on a delayed basis on this site or our facebook channel. See Wild Oats XI, Wild Oats X, InfoTrack, Black Jack, Naval Group, Scallywag and Winning Appliances in action. In a bid to encourage stronger female representation in Australian sailing and to promote ocean health and sustainability, an all-female professional crew to enter the Rolex Sydney Hobart Yacht Race has announced their campaign to lift the Tattersall Cup in Hobart. The Cruising Yacht Club of Australia’s (CYCA) is pleased to announce 92 yachts have entered the Rolex Sydney Hobart Yacht Race. The countdown to the 2018 Rolex Sydney Hobart Yacht Race is on! 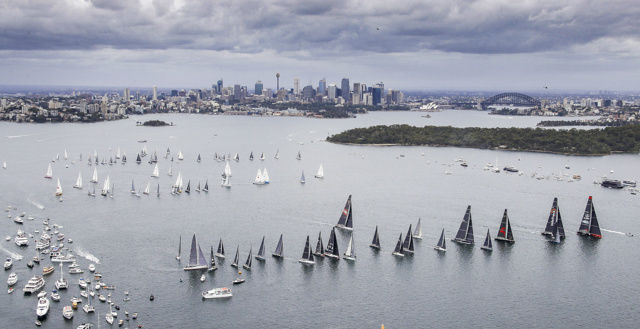 See the 75th Rolex Sydney Hobart in style! Tasmanian-based Richard Bennett has photographed the Rolex Sydney Hobart Yacht Race since 1974. Bookings for the Spectator boat are OPEN! Birth of a classic: the "Quiet Little Drink"
When Americans take line honours but don’t throw a party, Rupert Murdoch and Co. will throw it for them! Why don't we make a race of it? Rowan Johnston, one of the great stalwarts of Tasmanian yachting, as a competitor and honorary administrator with the Royal Yacht Club of Tasmania and the Rolex Sydney Hobart Yacht Race, passed away last week after a brief illness. The Cruising Yacht Club of Australia (CYCA) has released the Notice of Race for the 2018 Rolex Sydney Hobart Yacht Race – and already 8 yachts have registered to enter what is arguably the world’s toughest offshore racing challenge.